A few weeks ago, the last of our students returned home from their summer programs, bringing a close to our 2017 travel season. We CONGRATULATE all of our young leaders on their incredible accomplishments this summer, and THANK all of our summer partners and our staff (mentors, program managers, on-call specialists, and many more) for making these life-changing experiences possible for our students. Earlier this summer, we introduced you to Bay Area alumna and outdoor enthusiast Jessie Holtz, who works for one of those summer partners, Sierra Nevada Journeys (SNJ). She had the exciting opportunity to lead one of SNJ’s special Summer-Search-only wilderness programs in late July. Summer Search alumna and Sierra Nevada Journeys trip leader Jessie Holtz. After returning home, putting away her gear, and reflecting on this 15-day journey all over the beautiful Sierra Nevadas of California, she shared her thoughts with us on this unique experience. Jessie with an awesome rock-climbing selfie. Jessie, her co-leader, and the group of Summer Searchers from across the Bay Area packed in a lot of awesome achievements into 15 days. They spent four days rock climbing in Truckee, seven days backpacking trip in Lakes Basin (including choosing as a group to hike four miles out of the way to reach an additional mountain summit), and finished off the program with a thrilling day of rafting on the American River. In between those challenges, Jessie relished the chance to connect with her fellow Summer Searchers. 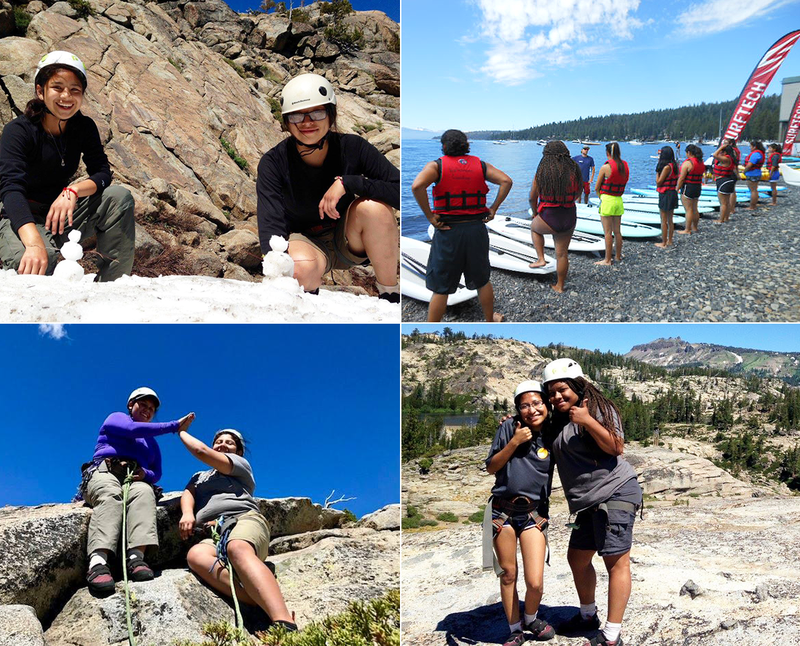 Bay Area Summer Searchers rock climbing, hiking, and rafting with Sierra Nevada Journeys. Click to enlarge. She also remarked how inspired she was by the group. Summer Searchers taking a break on a mountain top in the Sierra Nevadas. Photos courtesy of Sierra Nevada Journeys and the Gateway Mountain Center.